After reading Andy Benoit’s season preview for the New York Times, which predictably predicted that the Cards will regress in ’10, I began thinking about the most pressing questions facing the Cardinals at this point. Some of them may be redundant, but there’s no reason why we can’t consider them again. After all, there’s a good chance these issues may remain throughout the entire season. Without further delay, let’s consider the top ten things that keep Cardinals’ fans up at night. 10. Whether Breaston and Doucet will pick up Boldin’s slack. It seems like this issue may get overlooked a little due to Dansby and Rolle’s departure. Boldin, however, was a great possession receiver that would have provided a reliable target for Leinart. Also, Boldin’s YAC ability further cements his value as a first down and drive continuing machine. Breaston and Doucet will have to turn in great efforts to ensure that the Cards’ passing game doesn’t miss Boldin anymore than it needs to. I think both receivers will turn in fine efforts for the Cards, but the issue is pressing enough to earn the number ten spot. 9. Whether Dan Williams can contribute this year. A team should never expect too much out of a rookie, but it would certainly be nice if Williams hit the ground running. Gabe Watson and Bryan Robinson are not going to help the Cardinals in the middle of the defense. Williams is the only NT on the roster with the physicality and talent to truly impact the defense. As such, if Williams isn’t available to contribute because he’s adjusting to the NFL, which is entirely possible and understandable, the Cardinals look mighty soft and vulnerable up the middle. Things only get worse once an opposing running back hits the second level of the Cardinals middle (see issue number three now if you wish). 8. Whether Kerry Rhodes performs at free safety. Many analysts that know much more than I do bill this issue as far more important. Maybe that’s because I was never as sold on Antrel Rolle as most others. I watched Rolle play almost every game he suited up for at FS and I’ve said many times that Rolle was a feast or famine type FS. He often left the Cards vulnerable with his blown coverages. While Rhodes certainly brings some extra baggage with him, it’s difficult to knock his talent. I’m not nearly as familiar with Rhodes as I am with Rolle and I’m going to continue to give Rhodes the benefit of the doubt until he shows that he deserves otherwise. With all that positivity, the issue still earned number eight honors. 7. Whether Joey Porter adequately pressures the quarterback. Some people doubt that Porter still has it and others (including Porter, obviously) claims he does. I fall somewhere in the middle. I’m not nearly as concerned with the number of sacks Porter grabs as I am with whether Porter puts consistent pressure on opposing quarterbacks. In other words, I think it’s more important that Porter gets in the quarterbacks face, moves him out of the pocket, and rushes throws rather than actually getting there. If Porter is consistently causing problems and only records seven sacks I would be fully satisfied. Anything more would be a bonus in my mind. 6. Whether the new look offensive line builds chemistry. After developing a nice degree of consistency over the past two years, the offensive line added a lot of moving parts this offseason. Faneca and Keith project to be brand new members of the unit. In addition, Levi Brown will switch from right to left tackle. Finally, there remains a bit of a question mark at right guard as Lutui apparently showed up weighing nearly 400 lbs, according to Benoit of the New York Times. Reggie Wells, who has been taking the snaps at RG so far, will likely give Lutui a good battle in training camp. Also, Wells could step in at right tackle if Brandon Keith falters. While the Cardinals upgraded their line by adding Faneca and ditching problem Mike Gandy, it remains to be seen whether these guys can click as a unit. 5. Whether Brandon Keith protects Leinart’s blindside. The number five issue is heavily related to the number six. If it were not for Warner’s excellent defense reading and quick release, the fact that Mike Gandy and Levi Brown were awful last season would have been a much bigger problem. This year, the Cardinals will be without Warner’s pass rush beating skills. As such, protecting Leinart from the tackle position, particularly the blindside, will be a much bigger issue. Enter Brandon Keith who has exactly one NFL snap. This is quite a task for the third-year guy. If Keith can’t get the job done, the Cardinals will likely fall back on Reggie Wells. 4. Whether Wells gets enough carries to break out this year. Although Hightower may be the starter on paper, Beanie is the feature back for the Cardinals. It’s doubtful that Hightower will steal too many carries from Wells, but if the Cardinals field a paper defense there won’t be many opportunities for Wells to get 20+ carries a game. If that happens, expect a chuck-it-up type offense where Wells would be almost useless. This would be most unfortunate considering the Cardinals finally have a young, star running back on their hands. 3. Whether Paris Lenon holds down the ILB position. This issue really troubles me. Although I don’t think it was worth chasing down Dansby, his flight to Miami left the Cardinals in quite a bad spot. Paris Lenon simply isn’t going to get the job done in terms of stopping the run up the middle. Also, the Cardinals will miss Dansby’s ability to make plays on the edge and his solid pass coverage. To make matters worse, rookie Dan Williams is the best bet for the Cardinals to stuff the run on the defensive line. If Williams doesn’t make fast progress, opposing defenses could have an easy time gashing the Cardinals up the middle. Finally, if fellow ILB Gerald Hayes can’t go due to his injured back, the ILB unit and the Cardinals’ defense is in serious, serious trouble. 2. Whether Greg Toler lives up to his potential at CB. The number one defensive issue rests with Greg Toler’s performance at cornerback. 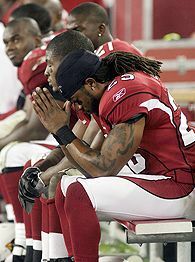 If Toler plays well I believe the Cardinals’ defense stands a very good chance of improving over the 2009 squad. Toler is a relatively untested player, but he replaced the injured DRC in the Divisional Round game and played quite well, although the Cardinals were getting annihilated. There are those in the Cardinals organization that even believe Toler to be more physically gifted than DRC, which would obviously make for an outstanding 1-2 punch at CB. Exactly how Toler will respond to the pressure to step up this training camp and preseason will ultimately determine whether he finds his way into the starting defense. I expect Toler to be starting when the season begins. 1. Whether Leinart takes control of his and the Cards’ future. While Leinart represents the number one issue, I don’t think there’s anything more to be said at this point. I’ve posted my thoughts on the Leinart situation here. Until we see Leinart against some live defense, I don’t think my feelings will change.